The first records of a lifeboat based at Rosslare point date back to 1838. It is probable that up to that year local fishermen would have always attended to vessels in distress as this was the practice at the time. However, as these boats were more suited to fishing than lifesaving, it became necessary to provide a dedicated lifeboat with trained crew where there was heavy traffic into a port such as Wexford. It must be remembered that all trading vessels at the time depended on sail and anchor only and this was especially dangerous in ports such as Wexford where the sandbanks and tidal bar were unpredictable and in a constant stage of flux. 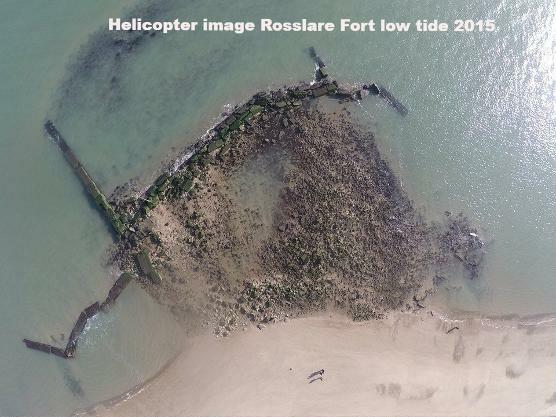 To this end, a dedicated lifeboat station was installed in 1858 which was known as Rosslare Fort. The terrible tragedy of the loss of the passenger vessel Pomona in 1859 on the Blackwater Bank really illustrated the danger of the Wexford coast. 386 people lost their lives in the wrecking. This disaster led in 1859 to the provision of a a larger lifeboat at the Fort. This boat became known as Wexford No.1 Lifeboat and it was kept permanently in the water, while the smaller Wexford No. 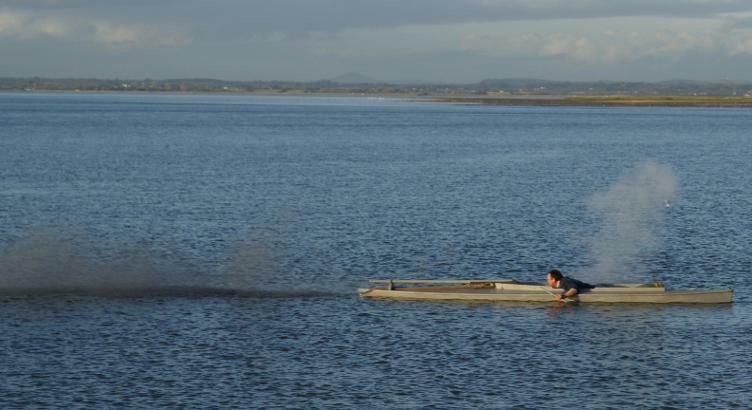 2 was kept in a boathouse to be launched by slipway. It was Wexford No. 1 boat James Stevens No. 15 that took part in the famous rescue on the wreck of the schooner Mexico in February 1914. 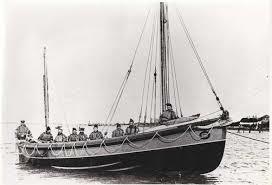 This type of lifeboat was known as 'pull and sail' as they were powered by a rowing team but could also raise sail for longer journeys. 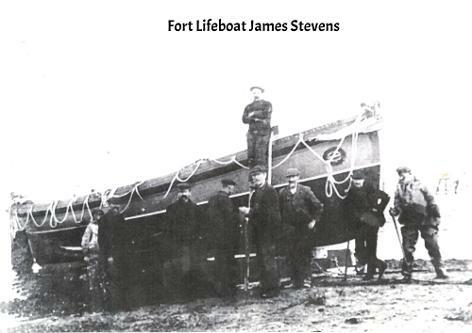 The first engined lifeboat came to the Fort in 1921. 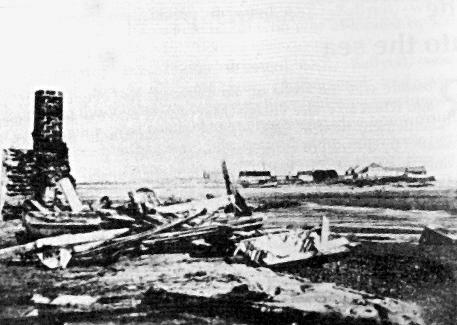 The Fort lifeboat station was destroyed in 1925 when it was overpowered by the sea along with the rest of the village. Thereafter, the lifeboat was stationed in Wexford but this was not ideal as it increased the passage time to any call-outs outside the harbour entrance. Photos, artifacts and records of the Pomona, James Stevens and Mexico exist in the James Stevens Museum, Rosslare National School, the Maritime Heritage Centre Kilrane/Rosslare Harbour and the Wexford County Museum, Enniscorthy. The Vikings and the Irish of the Burrow were renowned for fishing and fowling pursuits in this area which teemed with both. They carried on with their specialised methods of fishing, eel spearing and fowling right up to the establishment of the Bird Sanctuary in the 1950s. They were also famous boat builders and the tradition is still carried on there. Their unique eel spears, 'Scootches' and floats are still in existence and the famous Dr. Arthur Went, Research Dept. Ministry of Industry & Commerce had them copied, and they are now preserved in our National Museum in Dublin. Working from their flat-bottomed floats, the eel fishermen could traverse large areas of the mud flats of Wexford Harbour on their 'Scootches', replicas of the snow shoes used by Scandinavia of today. With two trident-shaped barbed eel-spears they could, by dexterous manipulation, spear large quantities of eel, given the right conditions. These were exported direct to Billingsgate to satisfy the British palate for jellied eels. When charming Queen Margrethe of Denmark stopped for quite a while at Rosslare station during her visit to Ireland in 1977, many of the hundreds of the inhabitants who assembled to greet here were descendants of the Viking warriors from her homeland. It would be hard to accurately date the erection of the first fort or watch at the tip of Rosslare Point. Because of it's location overlooking the narrow channel into Wexford, it can be said to have been a place of 'security guards' for a long time. 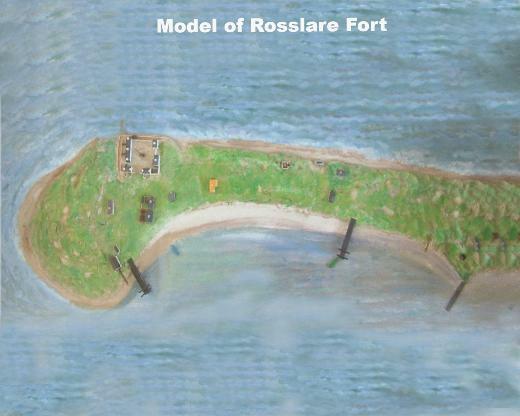 The first time the Fort of Rosslare appeared on a map was in 1599 when the Italian cartographer, Boazio, indicated it at the point of the peninsula. The major extension of it's defences and auxiliary services was undertaken by the Irish Confederate Forces in 1642. It was the period known in Ireland as 'The Great Rebellion' and elsewhere as the Civil or Cromwellian Wars. The Irish Confederates (a unions of all the older Irish racial groups, as distinct from the English governing faction) had seven massive guns installed to protect the gateway to their major port of Wexford. The Fort commander was Captain Paul Turner, whose family owned Ballygeary Castle, Kilrane. They believed that this would protect Wexford Town from invasion by sea and to ensure supplies if the town was cut off by land. A large reserve force was maintained by the Confederates at one of Ormonde's family seats, Butlerstown Castle near Bargy. Cromwell, after the sacking of Drogheda, proceeded to reduce Wexford but knowing of the Confederate Fort, sent his son-in-law, General Ireton, with a naval force and supply ships to destroy it and enter the harbour. At the same time, he sent a company of dragoons and foot-soldiers under Lt. Gen Jones to attack it from the Rosslare side. Some historians say that the garrison, then commanded by Capt. Sinnott, abandoned it and tried to escape by sea in a small frigate. Tradition says that Capt. Sinnott put up an heroic defence until, outgunned and outnumbered, they had to surrender. The Sinnott family home still stands, beautifully preserved, at the Burrow with the name dying out only in recent years. The Wickham, Shanley and Devereux families are all close relatives, with the Devereuxs preserving the homestead. 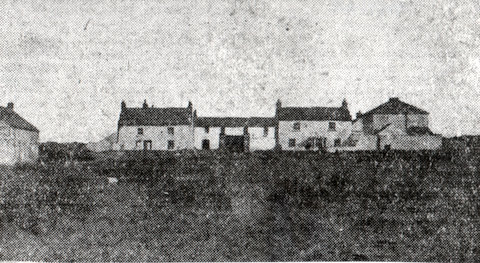 Other Sinnott families now live in the district, probably all related to the valiant captain whose family were the Sinnotts of Ballybrennan Castle nearby. Following the destruction of the Fort, the Puritans, as Cromwell's troops were known, marched the survivors and any inhabitants they could capture to the large valley in the sand dunes opposite Lambert's Corner, known as the Murder Hole (now washed away) and executed them. Military historians say that Cromwell succeeded easily at Rosslare Fort because all the guns pointed out to sea with no provision for attack by land. One of the Fort's cannon is still preserved by the family of Richard Walsh, one of the Rosslare Lifeboat's famous coxswains in Rosslare Harbour. The Fort was thereafter preserved for defence. Later it became a customs post and a pilot and lifeboat station. 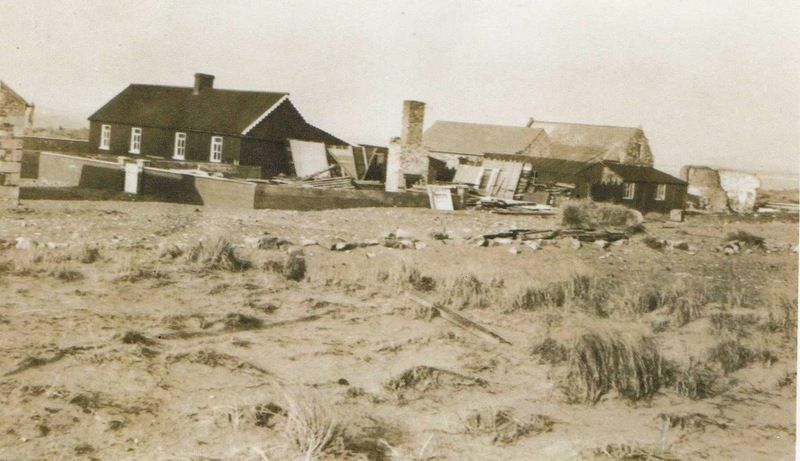 The Fort village consisted of over forty houses. A school was established and the school master came at weekends to hold a hedge school - literally under the hedge in Billy Meyer's Lane near the Burrow Caravan Park. The pupils contributed one penny and a bundle of sticks to make a bonfire. Another alternative was the Protestant school three miles away, the ruins of which still exist near St. Peter's Church at Kilscoran. A church was built at the Fort by the first Catholic Commander, Officer Warren in 1800. Richard Devereux, famous shipowner and builder of Wexford, presented it with a set of Stations of the Cross. Mr Devereux was a kinsman of the late Sr. Mary Angela Devereux, accomplished teacher and scholar of Rosslare Convent of Mercy, first organist of St. Brigid's Church, Rosslare. Names of well-known Rosslare families of the present day appear on the list of Revenue Officers at the Fort, including the Walshes, Goodalls, Wickhams, Duggans, Sheils, Doyles, Peares and Bents. A decline started in the 1880's with the withdrawal of the Customs & Revenue Station and the closing of the Fort's church, but the Lifeboat Station became more essential and famous. The village comprised forty to fifty dwellings and a school. By the 1870's this number had dwindled to less than forty as is recalled by the late Mrs. Margaret O'Brien in the Centenary Record of Wexford's Twin Churches 1958. The second commander named White was also a Catholic and during his time in the late 1850s the customs were withdrawn from the Fort. The focal point of the village was the 'Square'. This was a cluster of about a dozen houses built in the form of a square, all the houses facing the centre cobbled courtyard with the exception of two on the harbour side, which faced Wexford town and were separated from each other by a big green courtyard door. The square housed the Revenue officers and their families and the little Catholic church was situated in an upstairs room of the hipped-roofed house on the southern corner. The Stations of the Cross in the chapel were the gift of Richard Devereux the Wexford ship-owner who purchased them in Paris. In the centre of the courtyard stood a magnificent seventy foot flagstaff, a single pole, which had been fashioned in the Wexford dock-yard. At it's base was a small signal cannon. Just outside the square on the harbour side was 'Hill of 60'. This name predates the Great War but its origin is unknown. It was the highest sand dune and from its peak obtained a good view of the harbour and the outside bay. It was used as an observation post especially by the fowlers. Nearby was the old school-house, the village pump, the lifeboat house and store, the 'Rocket' or coast life-saving house and the remains of the old Fort. 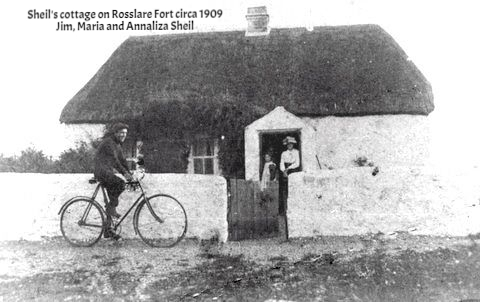 Stretching down the harbour side of the peninsula towards Rosslare were most of the houses of the village. From the shore two large wooden jetties extended into the harbour, the first almost opposite the Square known as the Revenue Jetty, being owned and used by the Revenue Officers. The second, the Pilots Jetty, was situated further south almost opposite the Pilot Station. Still further south was the old quay, a stone breakwater used by the fishermen. Nearby was the 'Schrump', a Barony of Forth dialect word, meaning a hollow. Here it was a sunken pit, similar to those used in garages to-day, permitting the drop-keel of the lifeboat to be lowered out for overhaul. When beached for periodic cleaning the lifeboat was floated on to a bogey and hauled by means of a capstan up rails to the schrump. 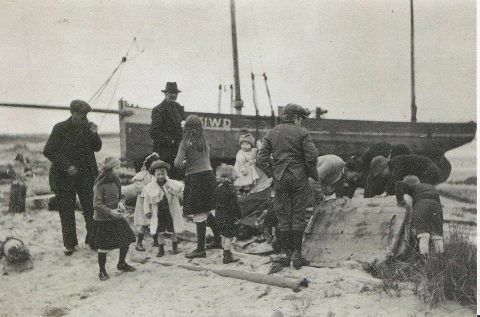 With the decline of the population in the village in the early part of the present century, the beaching of the lifeboat was always a special occasion because the women were called upon to help in turning the capstan. There was also a tide gauge near the old quay. In the early days of the village vessels were beached opposite the lifeboat house for careening or opposite the Pilot Station on the bay side as weather dictated. On the seaward side of the peninsula, starting from the point, we had first the wooden lighthouse, the circular foundation of which remained until the end of the last century. At the nearby groyne or breakwater small vessels berthed alongside on the southern side in the earlier days for minor repairs. There was a small workshop attached to a dwelling-house on the bay side of the Square. Next, the Tide Indicator or ball-box, a tall pole with a cross arm carrying up to five balls indicating the depth of water on the bar. One ball meant 8.5 feet, each extra ball adding six inches up to 10.5 feet with five balls. Above that each ball dropped to half-mast added a further six inches. All five balls 'dropped' signified 13 feet which was rare. At full tide a chequered flag was hoisted to the peak signifying ebb-tide and the balls disappeared as the level fell. A red flag flying from the peak indicated the bar was dangerous to cross. The indicator was surrounded by a rectangular wooden hoarding which acted as a shelter in bad weather. Further south we had the Pilot Master's house and nearby was the Pilot Station - a fine two storied building with a high verandah. Still moving South, we had a few more houses and then the 'Hill of Bull' another high sand dune on which was erected a perch acting as a navigational aid. The residents of the Fort could be divided into three classes, Revenue Officers, Pilots and Lifeboat Men. 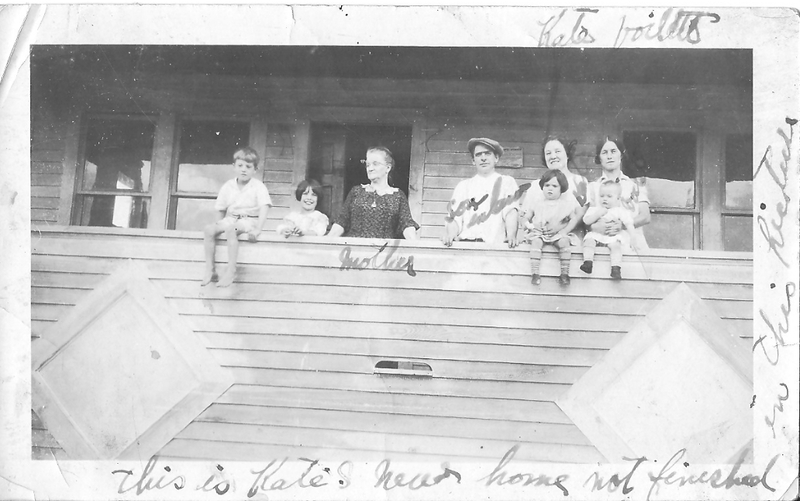 The Revenue Officers and their families resided in the Square convenient to their jetty. In the mid-eighteenth century the pilots brought in the vessels to the Revenue jetty where they were boarded by the officers. As trade in the port increased, the jetty became congested and the officers were obliged to meet and board all vessels in the outside bay. They were supplied with cutters which they themselves operated, seamanship and small boat drill being part of their training. If weather permitted they often went as far as the North and South shear (channel) - up to ten miles. 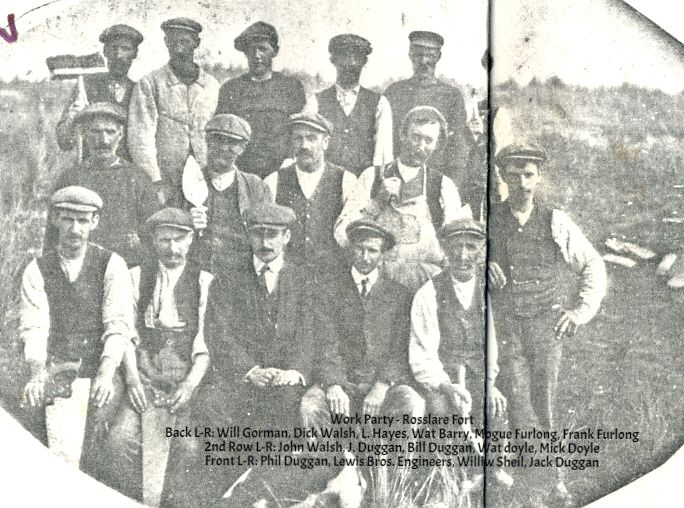 It was not uncommon to have Fort and Rosslare men in the service and such men as Jack Wickham and Jim Duggan from the Fort and Nick Goodall of Rosslare come readily to mind. The chief officer of the Revenue authorities or Customs at the Fort was given the title Commander as he had authority to fire the guns if needed. We still have a lot to learn about the Customs at this time. It is quite possible that the officers at the Fort were really 'tide-waiters' - officials who boarded the vessels to enforce regulations because we know that in 1651 the Customs decreed that only in Wexford at French's Quay and Common Quay was overseas shipping allowed to dock. Also, in 1769 Griffith refers to a very attractive Customs Station at the Crescent. With the withdrawal of the Revenue authorities from the Fort the little Catholic chapel closed after a life of approximately 55 years. The school closed about 1882, the last teacher Miss Shanahan opening a private school at the site of the present Ulster Bank in North Main Street Wexford. There were 10 pilots and a pilot master responsible for bringing vessels in and out of the harbour, and for chartering and buoying the channels. The resident Pilot Master with the status of a ship's captain was responsible for the station, the two pilot cutters, their tow-boats, the four-oared gig and the market-boat. He also arranged the routine of the staff and after each gale he took out the four-oared gig, a man in the stern operating a sounding pole while he entered the soundings in a book. The pilot master had his own dwelling at the Fort where he resided with his family. From the 1870's to about 1906 he had a fixed salary of £150 per annum. Pilots were recruited from men of long experience at sea and each was required to have at least six months service in a square-rigged ship, brig or barque so that he could handle any ship frequenting the harbour. Following a six months apprenticeship on the Station he went up for examination before two deep-sea captains who were always on the Harbour Board. The result of the examination would be sent to the Board of Trade. If they approved they sent him a parchment licence, which on leaving the service, he had to surrender within forty-eight hours under pain of a £50 fine. The pilot-boats or cutters were really large craft thirty to forty feet long and decked. They were ketch or schooner-rigged with gaff sails and were equipped with hammocks in case they had to remain out in the bay overnight to bring in vessels on early morning tide. On the Fort the pilots lived a bachelor existence in a common residence, but there was no common board. Each man provided and cooked his own meat and vegetables in nets in the large communal pot. Upstairs, in the Pilot House was a very large bedroom with bunks ceiled at six feet and with shutters in front to keep out draughts. Outside the bedroom windows on the bay side was a large verandah from which the movement of ships at sea could be watched. On the ground floor was the big dining room with its immense fireplace iron bars and big hobs. Down the middle ran a long table and under each side of it a pair of laths for the personal cooking utensils of each man. Each had his own place at the table marked by his chest, which was also his seat and in which he kept his grub. It was seldom locked. A clothes-rack ran like a picture rail round the room with two pegs for each man. A feature of the pilots work was his watch-week when he was known as 'look-out- man. It began with his Tuesday to Friday leave at home in town and then back to work on Saturday morning when he spent the whole week spotting the incoming vessels and reporting them. The pilots were allowed a 'nipper' to cook, tend the fires, keep the house clean, bail the boats, tend the lights etc. An old Wexford salt related to me the story of a temporary nipper appointed in 1906. He was 80 years young and was known as Jack the Skinner. He was illiterate and to count the pints of oil used weekly by the pilots he used white stones, putting one white stone into the special box for each pint used. The pilots often managed to spend extra nights at home by bringing in ships late in the evening and taking out ships early next morning. As often happened when all the pilots were engaged in bringing in vessels, the last ship towed up one of the pilot cutters to the quay and most of the pilots returned to the station in it. As stated, the pilots were responsible for charting and buoying the various channels and keeping a continuous and acurate check of the depth of water on the bar. This was recorded by the Tide Indicator and apparently skippers were not above reporting discrepancies in signalling. There were several large perches marking the inside harbour channel such as the North Perch, Watt Rossiter's Perch, South Perch etc. Incoming vessels entered the harbour by the North Embankment, took a sharp turn to port at the North Perch, moving almost parallel to the quay until they reached the South Perch where they took a sharp turn to starboard and from where they were brought up to the quay in darkness or failing light by the 'leading lights' at the Crescent. In the days of oil lighting these two leading lights were set on high standards, one at the South end of the crescent where the old public convenience now stands, and the other, the higher of the two, near where the statue of commodore John Barry has been erected. Both of those lights showed a red beam down towards the South Perch and by keeping both lights in a straight line one above the other or as the old Wexford salts described 'keeping both lights in one', a vessel came safely onto the quays. Later, when the old oil lamps were replaced by gas the leading lights were erected on brackets on the junction of the quay with Henrietta Street and on the corner of the present Customs House. Red panels in the lanterns provided the guiding lights whilst the lights at the same time illuminated the streets below. The number of ships passing and and out at high water were often more than the pilots could handle and I am informed that the tug 'Wexford' often towed as many as twenty vessels in one haul. To supplement the pilots on busy occasions we had 'mud pilots' or 'harbour pilots' usually retired sea captains who piloted the vessels up and down the harbour only, official pilots taking them over the bar. They were paid 2s/6d up or down the harbour by owners of the vessel and if no vessel was coming in they were put ashore at the Raven Point or at the Fort and had to walk home to town. There were also three or four auxiliary 'mud pilots' called 'Glut Men' who were called upon when there was a glut of shipping and insufficient 'mud pilots'. Vessels carrying coal kept the pilot station supplied with fuel gratis. It was also customary for the pilots to obtain gifts of salted bacon and when the mate or skipper was slow in offering or inclined to forget the gift the pilot was not above reminding him. One of the glut men named Devereux was a cantankerous character. Whilst drinking in Scallan's pub in Drinagh he inspected his piece of bacon only to find he carried a lump of Newport coal all the way from the Fort. His language was an instruction to all who heard him! The first free school-bus service in Ireland was founded in 1923, shortly after independence, when a horse-drawn vehicle supplied by Robb Duggan, Rosslare was used to make the trip twice each day to being the children of the Fort, three miles away, to and from school. This was paid for by the Free State Department of Education, but the children's hours of attendance were governed by the state of the tide, as the only approach was along the beach. 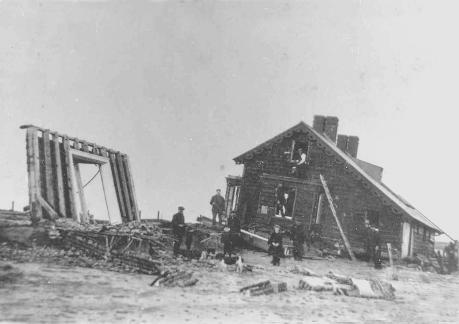 What some describe as a tidal wave struck the Fort in November 1924 and some of the settlement was engulfed by the sea. Very heavy storms continued and some of the people left. The seas broke through at a place called The Deeps, and for the first time the Fort became an island. With this happening, the fate of the Fort was sealed. Then in January 1925 a terrible storm forced the remaining inhabitants to abandon the Fort , escaping in fishing boats and the lifeboat. The huge fowling pieces used by the Burrow inhabitants for centuries up to the establishment of the present bird sanctuary are still in existence in the Burrow and are of great interest. Used from their flat bottomed floats, the fowlers shot large numbers of barnacle geese, teal and widgeon, which abound in the harbour. These guns were brought to Enniscorthy by boat to the Battle of Vinegar Hill up the Slaney during the rebellion of 1798 by the Rosslare men, where they caused great havoc amongst the advancing crown forces. They are immortalised in P.J. 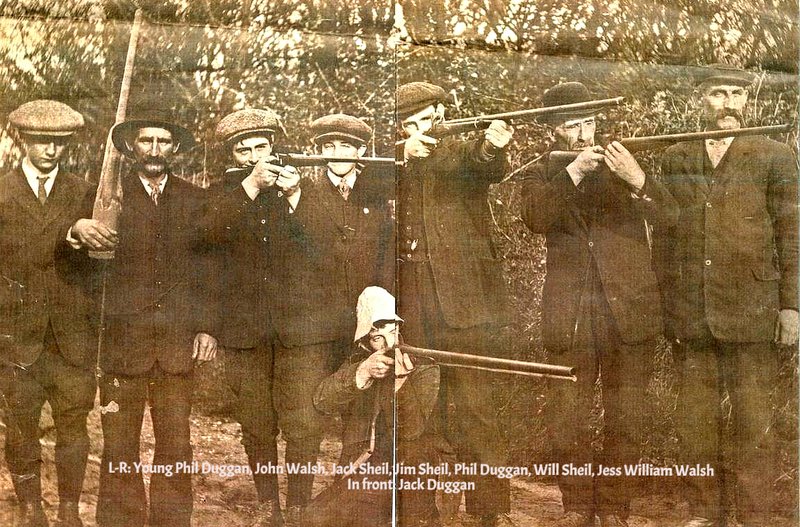 McCall's rousing song 'Kelly the boy from Killane' as the long barrelled guns of the sea.